Some dads actively help with the homeschooling, but there are others that I think would love to get more involved if they knew how they could help. Dad may think of homeschooling as Mom’s job if he is the one away from home during the day. If that is the case, perhaps all he needs is a little encouragement to know that his own special involvement is an important part of the homeschooling year. Yes, it’s possible to work full time and still be a part of the wonderful homeschooling experience! What dads do doesn’t have to look like school to be of benefit to the child. Years ago, something happened in my house that shows how dads can participate in homeschooling. When I got up one morning, I noticed that my husband had written a note on our kitchen whiteboard before going to work. The night before, I had written two sentences for our then ten-year-old son to correct when he got up – it was something fun that he loved doing. Dad had written his own sentence that was full of mistakes. What a day brightener! I knew my son would have fun correcting his dad’s sentence, and that his day would get off to a happy start. 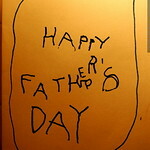 It was a simple gesture, quickly scrawled by a busy dad as he left for work early in the morning. Simple, but I knew something would be gently learned, and I also knew it was probable that our son would participate further in the joke by writing a fractured note in response so his dad would have something to correct too. They often played this kind of game, either with words or drawings. This is how Dad participated in our homeschool. It might be a message on the whiteboard. Or playing a game at night, often something involving math or geography, or maybe a strategy game. On weekends, they worked in the garage together, talked about science, and because our son was interested in woodcarving, they joined a club and learned together. I usually found a good book for their nightly reading time, although sometimes my husband selected one he enjoyed from his own childhood, and that was a book that was extra special. He was a very important part of our son’s homeschool education. Sharing homeschooling with Dad (or Grandpa or a friend) is good for the kids and it gives moms a great break too, so it’s a win-win! Written by Karen Taylor, posted on 16 June 2012 at 8:41 pm, and filed under Learning Ideas, Unschooling. Bookmark the permalink.